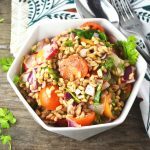 A delicious and easy Farro Salad recipe made with tomatoes, radish and herbs. It's perfect for lunch or as a healthy side dish. Put the farro in a large sauce pan, cover with plenty salted water and bring to a boil. Cook for 15-20 minutes until tender, drain and cool. Cut the cherry tomatoes in half and add to the bowl. Finely chop the red onion and finely slice the radishes and add that to the bowl along with the cooled farro. Mix everything together to combine. Check for seasoning and add more if required. Serve.